Idles about. Occasionally says "Erk" or "Baroo" while running in circles around the player. Gives quests as part of a lengthy quest chain. This pet is one of four falcosaur hatchlings. 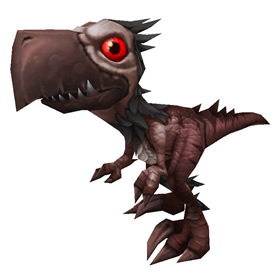 The Bloodgazer Hatchling can only be obtained when the Broken Isles World Quest "Bloodgazer Swarm!" is active on the coast in Azsuna. If the World Quest for this specific falcosaur species is not active or is about to time-out, the NPCs necessary will not be visible. The Matriarch of the species will spawn during the active World Quest. Defeating her will allow you to see an Orphaned Bloodgazer in the questing area. Interacting with this NPC will not yield any results unless you have the hatchling's favorite type of food. The pet's journal description hints at what type of consumable it prefers. This particular falcosaur enjoys Azsunian Grapes. After purchasing the food from a Broken Isles vendor, interacting with the orphaned hatchling will reveal a new dialogue option. Clicking this will add the pet directly to your Pet Journal. Once added to your collection, this hatchling will have a lengthy quest chain for you. More information can be found on our Patch 7.1 PTR - Falcosaur Hatchling Preview! Slashes savagely, dealing 433 Flying damage. Swarms the target, causing 236 Flying damage every round. Lasts 2 rounds. Increases the critical strike chance of your active pet by 75%. Lasts for 3 rounds. Love this pet! He is awesome as a level 25 leveler pet. I usually take him with my 2 other pets I am leveling. Overall, as a battle pet however, i think the current rating is fair. This note is for anyone having trouble finding the orphaned Bloodgazer. After you kill the Matriarch and then loot her. Head south. You will see a small island with six big rocks on it, two starfish and no plants. The orphan won't eat the Azsunian G's, but once he gets a whiff of them; he will be your best friend forever. I got all 4 of the orphan chicks, in some cases, I helped kill the matriarch. In others, I didn't, but was still able to befriend the chick. Long questline results in an adult mount of the same type. Is anyone else having difficulty completing 3 WQ Pet Battles? Yesterday there was no Fight Night in Dalaran and I could only find one on the Broken Isles. Jarrun's Ladder. One a day will obviously require three days to complete a 'daily' quest. Four pets will be twelve days? I killed the matriarch 4 times the last time the world quest was up. I found the orphan each time but it woudl never interact with me or ask for the food. Warning squawk will cause weather effects like the talent Scorched Earth to crit YOUR team as well. However... the possitive side of this talent is that it is a teamwide effect, meaning anything you have in play is boosted with 75% crit chance. 2 take him to silvermoon city to the inn. 3 defeat 3 Erudite manafiends. 4 complete 5 daily qeusts in Azsuna with him summoned and following you. I will update as in go along. As of Tuesday, Nov 9, 2016 (Patch 7.1), Hatch has been replaced with Reckless Strike. This makes me very, very sad. A great tragedy has occured; hatch is no longer an ability. It's been replaced with Reckless Strike. Make sure you have the proper food in your bag before you begin, and that your faction tags the matriarch first. I bugged out today-- killed the matriarch several times but never saw the orphan spawn. I haven't completed the quests from the 2 falcosaurs i already have though; I wonder if that's a requirement? One trick that I did after starting the quest chain on my level 110 was to finishing leveling the pet to 25 on an alt char that wasn't max level yet for the free exp. Though they may look fierce, the bloodgazer species of falcosaur has a beak that makes it predisposed to consuming fruits.